Colorectal cancer (CRC) is the third most commonly diagnosed cancer in the United States . The incidence of CRC in Asian countries is increasing rapidly, a trend that is similar to that seen in Western countries [2, 3]. Approximately 20%-25% of patients will present with metastatic disease and an additional 20-30% of patients will develop metastatic disease after surgery [4, 5]. However, without treatment, these metastatic rectal cancer (mRC) patients will have a life expectancy of only between 5 months and 6 months in stark contrast to patients diagnosed without metastasis [6, 7]. Currently, the combination of surgical techniques, diagnostics, radiotherapy and new oncologic drugs has contributed to improved outcomes in rectal cancer (RC), including prolonged survival in mRC . The overall survival of patients diagnosed with unresectable metastatic colorectal cancer has increased to more than 30 months with the integration of multiple cytotoxic agents and targeted therapies . Although RT was included in the National Comprehensive Cancer Network (NCCN) guidelines as a treatment option for various types of cancer, population-based studies report a general underutilization of palliative radiotherapy . However, the real-world effect of RT on survival of cancer patients might do exist and was worth exploring. In addition, metastatic nasopharyngeal cancer, metastatic prostate cancer and metastatic breast cancer are reported to have a survival benefit when treated with radiotherapy (RT) [11-13]. Therefore, we conducted this study using the Surveillance, Epidemiology, and End Results Program (SEER) database to determine whether mRC patients who received radiotherapy therapy had improved cause-specific survival (CSS) compared with those who did not. Data were obtained for all patients with a diagnosis of malignant primary rectal cancer from the SEER Program of the National Cancer Institute (Figure 1). The SEER Program is an authoritative source of information on cancer incidence and survival in the United States. The SEER database provides a comprehensive source of population-based information and included all newly diagnosed cancer cases that occur in people residing in SEER-participating areas. Between 2004 and 2013, the SEER database included approximately 28% of the United States population. Patients were selected based on the following criteria: (1) patients were diagnosed from 2004 to 2013, (2) patients presented with mRC, (3) patients had no history of other cancer, (4) patients were diagnosed with confirmed histology, (5) patients were under active follow-up, (6) TNM stage was known, (7) the surgery status of patients was known, and (8) information on CSS and survival months was available. The different baseline characteristics between patients treated with RT and without RT were compared by Pearson chi-squared test for categorical variables. The endpoint used for comparison was rectal CSS based on selected patients. For univariate analysis, the Kaplan-Meier method with a log-rank test and a univariate Cox proportional hazards model were used. Age at diagnosis, gender, race, marital status at diagnosis, grade, T stage, N stage, histology, status of surgery, radiotherapy, and tumor size were included in the multivariate analysis by a Cox proportional hazards model. In observational studies, there can be significant bias introduced by inherent differences between patients based on treatment selection. 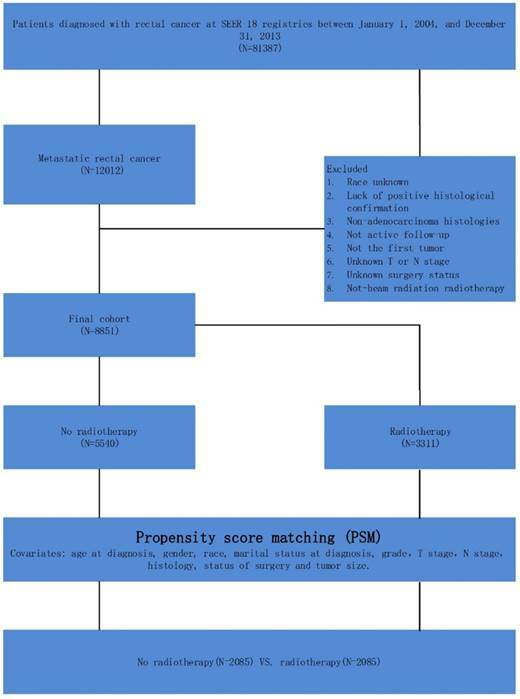 To decrease the risk of biased estimates of treatment effect, we defined the logit of predicted probability of treatment as a propensity score using the following baseline characteristics that strongly related to the survival but less strongly related to treatment: age at diagnosis, gender, race, marital status at diagnosis, grade, T stage, N stage, histology, status of surgery and tumor size [14, 15]. Subjects receiving RT were matched on a one-to-one basis with subjects without receiving RT. Matching was performed based on nearest-neighbor matching, and RT and no-RT patients were matched within their respective risk groups. Propensity scores reflect the probability that patients received RT or did not receive RT based on their baseline characteristics. A total of 8851 patients with mRC were identified in the SEER database. Patients' baseline demographic characteristics are summarized in Table 1. In total, 5540 patients who did not receive RT and 3273 patients who did receive RT were included in the analyses. For the overall cohort, what is evident is that patients less than 65 years old were more likely to receive radiotherapy (59.2% vs. 67.4%, p <0.01). Besides, patients who had T3 stage disease (53.9% vs. 58.6%, p<0.01), had N1 stage disease (34.0% vs. 41.2%, p<0.01), or had not undergone surgery (35.7% vs. 40.9%, p<0.01) were more likely to receive RT. Other characteristics were similar in the groups with and without RT. Propensity score (PS) matching was performed on the overall cohort, and resulted in 2085 patients in the no-RT group and 2085 patients in the RT group. The median follow-up time for the overall cohort was 16 months. At the end of the follow-up time, 5916(66.8%) patients died of mRC, and the 1-, 3-, and 5-year CSS rates were 68.3%, 31.6%, and 15.8%, respectively. The results of multivariate analyses by Cox regression is detailed in Table 2. RT was identified as a predictive factor for survival on univariate analysis (Figure 2A, HR=0.713, 95%CI=0.675-0.752, P<0.001). Factors that showed prognostic significance in univariate analysis were included in multivariate analysis of the overall cohort. When multivariate Cox regression analysis was performed, the outcome showed that RT was associated with a significant increase in CSS (RT, HR=0.702, 95%CI=0.665-0.741, P<0.001, using no RT as a reference). In addition, we identified nine factors as independent protective factors included age, marital status at diagnosis, grade, AJCC T stage, AJCC N stage, histology, surgery status and tumor size. However, gender was not a prognostic factor according to univariate survival analysis (P = 0.189). Propensity score matching was performed and resulted in 4170 patients. After PS matching, the 5-year CSSs of patients in the RT group and no-RT group were 22.0 and 13.5% respectively, a statistically significant difference in univariate analysis (Figure 2B, p<0.001). Schematic representation of patient population selected from SEER database. The overall cohort contained 5520 mRC patients who had undergone surgery. Table 3 shows that patients less than 65 years old were more likely to receive radiotherapy (59.3% vs. 72.4%, p <0.01). Both univariate analysis (HR=0.617, 95%CI=0.574-0.663, p<0.001) and multivariate analysis (HR=0.654, 95%CI=0.607-0.704, p<0.001) showed that RT was associated with significantly improved CSS (Table 4). Multivariate analysis also identified the following independent prognostic factors for CSS: patient age at diagnosis, patient marital status at diagnosis, tumor grade, tumor T stage, tumor N stage, tumor histology, patient surgery status and tumor size (p<0.05). In addition, PS matching was performed using the above independent prognostic factors. The PS matching resulted in 2862 patients, and univariate analysis of the surgery subgroup showed that the 5-year survival rates of the RT and no-RT groups were significantly different (Figure 3A, 30.3 and 18.0%, p<0.001). Multivariate Cox regression analyses of CSS. Baseline characteristics of the surgery group. Multivariate Cox regression analyses of surgery group. Survival curves of mRC patients in SEER database (A). Before PS matching: the 5-year CSSs of patients in RT group and no-RT group were 21.2 and 12.6%, respectively, of which the difference was statistically significant (P<0.001), (B). After PS matching: the 5-year CSSs of patients in RT group and no-RT group were 22.0 and 13.5%, respectively, of which the difference was statistically significant (P<0.001). Survival curves of mRC patients in SEER database after PS matching (A). In surgery group: the 5-year CSSs of patients in RT group and no-RT group were 30.3 and 18.0%, respectively, of which the difference was statistically significant (P<0.001), (B). In no-surgery group: the 5-year CSSs of patients in RT group and no-RT group were 8.4 and 4.0%, respectively, of which the difference was statistically significant (P<0.001). The overall cohort contained 3331 mRC patients who had not received surgery. Table 5 shows that patients with T3 stage tumors were more likely to receive radiotherapy (32.7% vs. 44.5%, p <0.01). Both univariate analysis (HR=0.785, 95%CI=0.723-0.852, p<0.001) and multivariate analysis (HR=0.779, 95%CI=0.717-0.847, p<0.001) show that RT was associated with significantly improved CSS (Table 6). Multivariate analysis also identified the following independent prognostic factors: patient age at diagnosis, patient race, patient marital status at diagnosis, tumor grade, tumor T stage, tumor histology and status of surgery (p<0.05). In addition, PS matching was performed using the above independent prognostic factors. The PS matching resulted in 1782 patients and univariate analysis of the no surgery subgroup showed that the 5-year survival rates of the RT and no-RT groups were also significantly different (Figure 3B, 8.4 vs. 4.0%, p<0.01). Baseline characteristics of the no-surgery group. Multivariate Cox regression analyses of no-surgery group. RT is reported to be used as palliative treatment to effectively relieve pelvic symptoms such as bleeding, pain and other pelvic symptoms in the clear majority of patients with symptomatic rectal cancer [16-19]. According to the NCCN clinical practice guidelines on rectal cancer (version 3.2017), in the case of mRC, RT was only recommended for patients to reduce the pelvic recurrence. And Yamada S et al. suggested that Carbon-ion radiation therapy may be an effective treatment for locally recurrent rectal cancer. The survival benefit of RT, however, was inconclusive, and the results were restricted by the amount of the samples [21-24]. In addition, prospective studies demonstrating a survival benefit for patients with mRC receiving palliative RT do not exist. SEER is a comprehensive population-based database in the United States that includes disease stage at initial diagnosis, initial treatments performed, and accurate data regarding patient survival. In this study, a total of 8851 patients with mRC were identified with initial presentation between 2004 and 2013 in the SEER database and our analyses indicated that RT was associated with an improved survival benefit. An interesting phenomenon in the overall cohort was that patient age was negatively associated with the receipt of RT, and one explanation for this phenomenon was the presence of comorbidities. RT is usually used for symptoms management and few reports suggest decreased efficacy or increased toxicity when palliative RT is used in older patients. However, the reasons behind this phenomenon are unclear and deserve further investigation even in the oldest patients [25-27]. For now, surgery provides the best treatment for rectal cancer, and chemotherapy can be a valuable adjunct therapy when given in a (neo-)adjuvant fashion or as conversion therapy to reduce tumor size in the initially unresectable tumors of mRC patients. RT is a successful, time-efficient, well-tolerated, and cost-effective intervention that is an indispensable component of palliative oncology care, and the clear benefits of RT for the treatment of stage II/III rectal cancer have be identified. However, the role of RT in the treatment of mRC is not yet clear. There is very little data concerning the survival benefit of RT in mRC, and the earliest exploration we can found is in 2010, when Kim and his colleagues  suggested that RT could significantly reduce the pelvic failure rate but its influence on overall survival was unclear with a retrospective clinical study containing only 89 patients diagnosed with synchronous liver metastasis. In 2012, Chang CY et al. compared the effect of concurrent postoperative RT with chemotherapy to postoperative systemic chemotherapy without RT by the analyses of 69 patients with mRC after complete resection and found both no apparent survival benefit and reduced local recurrence of postoperative RT in mRC after complete removal of tumors. Also in 2012, a study in Korea believed that the survival benefit of RT in mRC was not apparent after an analysis of 68 patients with metastatic rectal cancer . Similarly, Min et al. analyzed 176 patients with mRC who underwent TME and reported that pelvic RT might have benefits in locoregional control, yet the survival difference was not significantly different between the RT and no-RT groups after surgery. From the above it can be seen that the previous studies suggested that the survival benefit in mRC was not apparent or inconclusive. However, we did not agree with the conclusions and we think their results were restricted by the amount of samples. In 2001, Crane et al. found that chemoradiation combined with surgery had an improved 2-year survival compared with radiation alone, which is in good agreement with our analysis. Before PS matching, the 5-year CSSs in the RT group and the no-RT group for the overall cohort were 21.2% and 12.6%, respectively (p<0.01), similar to outcomes after PS matching. The 5-year CSS for patients who had received RT was 30.3% compared with 18.0% for those patients not treated with RT in the surgery subgroup (p<0.001) and the improved 5-year CSS was higher than that of the overall cohort. In addition, the no-surgery subgroup also showed an improved CSS, but not as obvious as the surgery subgroup, which is consistent with the study above: mRC patients who have received surgery are more likely to be treated with RT than those who have not received surgery. In clinical practice, many clinicians recommend postoperative RT in mRC patients after curative resection based on the NCCN guidelines. We strongly agree with this way according the result of our analyses. RT can not only relieve pelvic symptoms and reduce local recurrence but also provide apparent survival benefit after surgery. Beyond that, the adverse effects offered by radiotherapy are often favorable when compared to those caused by chemotherapy. Except for the increased fatigue, the toxicity of radiotherapy is limited to the normal tissues . And most common radiotherapy adverse effects resolve within 4 weeks after the completion of treatment, previous studies also showed that quality of life could return to baseline within 1 month [32, 33]. A 12-year follow-up of a multicenter randomized controlled trial  showed that the improved CSS with radiotherapy was weakened by an increase in other causes of death, we therefore believe more research is needed to determine a more accurate role for RT. What might account for the survival benefit of palliative RT to mRC? Patients with metastatic breast cancer, renal cell carcinoma, prostate cancer, lung cancer, and primary brain tumors are reported to have a survival benefit with the use of RT to treat the primary or metastatic disease by decreasing tumor burden [35-39]. RT could eliminate the primary tumor burden of rectal cancer, which reduced the probability of death by uncontrolled local disease progression, and a reduced tumor burden might reduce the source of cancer cells that could metastasize by “self-seeding” . Therefore, RT may reduce the number of circulating rectal cancer cells. Many studies have documented the myriad mechanisms through which RT can increase the sensitivity of tumor cells to direct T-cell-mediated killing . Therefore, we also think RT-enhanced immune function may be responsible for the improvement of survival. And Low dose radiation has been shown to induce biological responses like inflammatory responses, innate immune system activation, the repair of cellular DNA and protein damage which are the adaptive response . Still, the mechanism underlying the survival benefit of RT to mRC remains unknown. In addition, RT is also reported to exert local and distant effects on tumor cells migration through mechanisms including vascular damage, EMT induction, cytokine production and macrophage-induced metastasis [43-45], leading us to believe that the mechanisms underlying the impact of RT to metastatic disease are complicated and include multiple factors. Above all, we strongly believe that the mechanisms and interactions behind this phenomenon deserve further and careful investigation. Our study had several limitations when using the SEER database for analyses. The first limitation is that the SEER database does not collect detailed follow-up information, so we were unable to identify whether the patients originally presented with mRC or developed metastatic disease after the diagnosis of rectal cancer, and then received palliative RT. There is a possibility that the efficacy of palliative RT differs between the patients who originally presented with mRC and those who developed metastatic disease after the diagnosis of rectal cancer. Next, SEER reporting does not specify the regions where RT was administered (i.e., the pelvis, the primary tumor, metastatic sites or a combination). The regions to which RT was administered might also be associated with the efficacy of RT. Finally, the RT modalities used were heterogeneous. Although there is no evidence of a survival difference between different irradiation modalities in the literature, the heterogeneity in different treatment modalities may affect the outcomes. Despite these drawbacks, we believe our analyses provide a better understanding of the role of palliative RT in mRC patients and could induce more relevant studies that will direct the clinical application of RT in rectal cancer patients with metastasis in the future. Currently, surgery and chemotherapy are the primary treatments for mRC. However, our analyses using the SEER database suggest that RT could provide significant survival benefits for patients with stage IV rectal cancer, and we thus argue that standard local treatment should not be disregarded in patients with metastatic disease. We also believe these results need to be tested in more clinical trials to elucidate the biological mechanisms by which RT affects survival, to identify which patients might best benefit from RT, and to accurately define the role of RT in the comprehensive treatment of mRC patients. We have great respect for the work that goes into compiling and maintaining the Surveillance, Epidemiology, and End Results Program (SEER) tumor registries, including the interpretation and reporting of these data and so on. The National Natural Science Foundation of China (Grant Nos. 81702353 and 81772599) and Shanghai Municipal Natural Science Foundation (17ZR1406400) supported this work. The funders had no role in the study design, data collection and analysis, decision to publish, or preparation of the manuscript. The data of this study can be freely available from the Surveillance, Epidemiology, and End Results Program database.